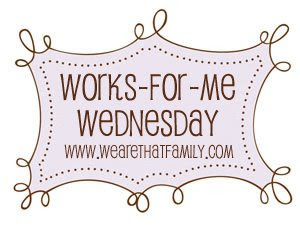 I was so excited to learn that this week's edition of Works for Me Wednesday is the "backwards edition," where I ask y'all for help with a problem. Because I desperately need help with this little laundry issue I'm having. Every now and then, I'll pull some clothes out of the wash only to discover they have blue stains on them. The stains are impossible to remove. Nothing I've tried (even my beloved Carbona Color Run Remover) has touched them. I'm pretty confident the stains are not the result of another piece of clothing "running" because I don't think a color run would spot stain like that. At first, I thought it was the laundry detergent. So, I switched to a clear-colored liquid detergent and made a point to add the detergent only after all the clothing was completely submerged in water (so the detergent wouldn't hit dry clothing and spot stain). But, that hasn't fixed the problem. I'm completely stumped -- and a little irritated. It always seems my favorite items of clothing -- or even worse, my daughter's school uniform -- fall victim to the blue spots. Does anyone know what is going on here and how I can stop it from happening? Thanks in advance for trying to help a sista out. Now, the tree branches are covered in white again. There's nothing quite as beautiful as when the dogwoods bloom in Georgia. They bloom around Easter each year, which always makes me think of the following story. It's a great visual reminder of all we celebrate this time of year. As a child I heard this tale. there were many dogwood trees. form of a cross two long and two short petals. and all who see this will remember." I’m pretty sure I’ve mentioned it before — I’m cheap. It causes me great physical pain and emotional anguish to drop $200 on a cocktail dress I’ll only wear — at best — a handful of times. And, with the economic situation being what it is, it was pretty much a given I’d spend zippo on a new frock this year. But, turns out, I did snag a new dress for the gala. It was a black, long-sleeved number that hit right about the knee and had a great plunging neckline. I love its versatility — I easily dressed it up for this event, but can also wear it more casually on a day-to-day basis. So…wanna know where I got it? Wanna know how much I spent? Okay. Lean in a little. One of the main components of the "redo" involved adding some fabric to the room. Normally, I'd try to find some remnant fabric, but I absolutely fell in love with a fabric shower curtain from Kohl's. I managed to get it on sale and proceeded to get the most mileage out of it that I could. First, I made a "skirt" for under the vanity. I ended up sewing it, as it involved the kind of sewing I tend to be fairly decent at -- straight lines. Isn't that candle centerpiece on top cool? I picked that up on sale at Kohl's, too. The weird thing about our house is that we have a ton of switches and outlets. A ton. There are some light switches that I still have no clue what they turn on. Anyway, we had a very odd grouping of outlets on the facing wall when you walked into the bathroom. I'm not sure if you can see so well in this picture. They're above the obnoxious looking radio and half camouflaged by the calendar my husband stuck up there. The great thing about these shelves is that I managed to fill them by pretty much "shopping the house." I bought the bamboo boxes on the bottom shelf (clearance $8.99 each). Other than that, everything else was something I already had. The shelves aren't perfect -- but they'll do for now. Three supa-fab new bathroom rugs finished it off. Even though I went a little over budget, I realized I could totally transform a room for a lot less than I would have thought possible. Which really, is quite a revelation for me. So that's what I learned this week (actually, what I learned over the last few weeks). To see what everyone else learned, head on over to Jo-Lynne's place for the What I Learned This Week carnival! I don’t know about you, but at this point in the winter season, my hands have pretty much had it. I've been watching too much HGTV. That happens every now and then. I can always tell when my watching gets a little out of hand because that's when I start dreaming up all sorts of "home decorating" projects -- as if I'm some sort of female David Bromstad. All of a sudden I'll walk into a room and the fact that we don't have say, window treatments, will really start to bug me. So, I begin figuring out how I can get the job done with minimal money spent. The latest victim of my unbridled creativity: our master bathroom. It's pitiful. It has looked pretty much the same way it has looked since we moved in eight years ago. There's no decor theme -- it's pretty much a mish mash of whatever I happened to throw in there. It's bland and pretty boring. But, over the last week, I have worked diligently to transform it! I'm thrilled with the results, which I promise to share later in the week (I just need to finish a few last minute things before I post the after pictures). Long story made short: I gave myself a budget of $200. Now, that might seem like a lot, but the bathroom had a shelving project that had been incomplete for eight years, so I knew a fair portion of my budget would go toward finishing that. Once I got the major things done, I found I had little left over for finishing touches like artwork. So, I figured out how to make some artwork on the cheap. It's not rocket science (I'm no Nester), but here's what I did -- and I bet it's something you could do, too! I loved the design and started to think about how I could use the notecard as the basis for some artwork. I went to Walmart and bought two 8x10" frames for $3 each. Next, I opened the card and cut the front from the back. I made sure to keep the dark brown piece close by -- I was going to use that later. Then, I cut the front of the card into two pieces. I liked the gold bird better, so that was the part I wanted to use. Then I grabbed some scrapbook paper that featured the colors I was using in the bathroom. Because I was making two pictures, I used two 12x12" sheets of paper, which cost a whopping 33 cents each at Hobby Lobby. Then, I just stuck it in the frame. Piece of cake. I actually made two of these pictures, one for each side of our bathroom counter. They work perfectly. So, that's what I learned this week. How to create great looking artwork for a song. These pictures cost me about $3.50 each. Now, go visit Musings of a Housewife to see what everyone else learned this week! What I had feared would be a difficult week away from the computer actually turned out to be exactly what my weary soul needed. As my good pal Soliloquy pointed out, "I know you will hear from the Lord. We always do when we just shut up for a pair of minutes!" Blogging has blessed me in so many ways. It's a fantastic creative outlet for me. I love and cherish the relationships I've built with all of you. I've learned so many things that have enhanced my life in one way or another. "But, to paraphrase something written by a friend, there is a great danger in blogging especially for anyone who thrives on success and creativity. The danger is that we cannot differentiate between the good that comes from creating, connecting and providing and the evil that comes from being pulled away from the family and into a cycle of NEEDING to succeed for our own egos. There is a powerful push and pull between the good and bad. I believe that applies to anything that has the power to pull us away from what should be our primary priorities, whatever those happen to be." That, I'm ashamed to say, is where I was. Stuck in the middle of that push and pull. And -- don't misunderstand -- it's not like I have it all settled now. It's a constant struggle for me to keep my priorities in check. One week off has not set me on the right path forever. But, I'm going to make a few changes to try and keep life in check, because -- if nothing else -- this past week has reminded me that I'm a wife and mother first and foremost. What the heck does "subscribe in a reader" mean?